Chronic pancreatitis is often associated with severe chronic pain. The Frey procedure is an established procedure for pain in chronic pancreatitis. A laparoscopic technique for this procedure has not been described previously. In this video we describe a redo Frey procedure with a peustow-type pancreaticojejunostomy. The patient is a 46y old female with familial pancreatitis who previously underwent a peustow procedure to the body and tail of the pancreas. The patient had persistent pain after surgery. A laparoscopic-assisted Frey- type pancreatic is described with a Peustow-type pancreaticojejunostomy in this video. The reconstruction: a Roux-enY pancreaticojejunostomy was perfomed with a Da Vinci robot system. The patient remains asymptomatic 2y after surgery with minimal pain and a marked improvement in her performance status. 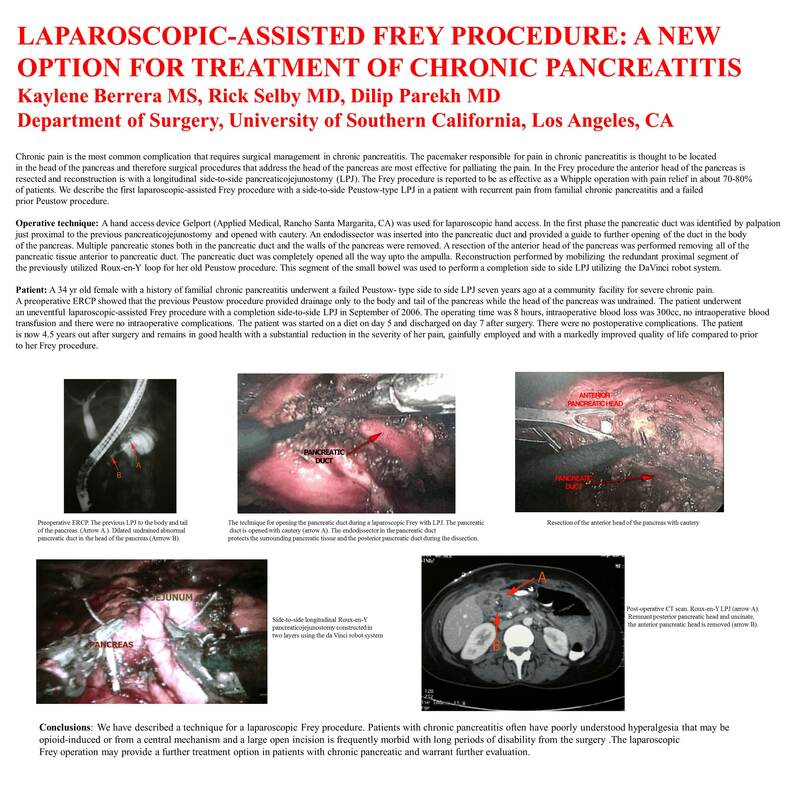 Laparoscopic Frey procedure may provide a new treatment option in patients with intractable pain from chronic pancreatitis.